Before Dubai became the glitzy capital of the famously fashionable that it is today, it was once an arid land of Bedouins. A semi-nomadic people who traversed the desert with their herds of camel and goat, eternally in search of oases that would sustain their agriculture. Everything from the famed dates and coffee of Dubai to the cultural amusements of today, like camel racing and hunting, trace their origins back to these nomads that had settled in the oases of Hatta and Al Aweer. And the one thing that has remained a constant through the centuries in Dubai’s history is its trade. It was trade that brought Dubai its fame, paved the way for its later riches and even decided where the city itself would come into being. On the banks of a creek. Take an abra, the traditional wooden boat on this very creek where Dubai’s story began; from Diera to Bur Dubai, from the new to the old. To Al Bastakiya Quarter or Al Fahidi Historical Neighbourhood. How to get to Bastakiya? What to See & Do in Bastakiya? Where to Stay in Bastakiya? An Abra docked in the courtyard of Al Fahidi Fort, which houses The Dubai Museum today. Built in the 1800s for settlers from the Bu Flasa tribe, when Dubai first became an independent political entity, the Al Fahidi area even today is home to the Ruler’s Court Mosque, the Al Fahidi Fort and the old residential houses. Only, these houses of the past have now been restored and converted to cafes and galleries, cool and quirky. While this entire area in and around Al Fahidi is formally known as the Al Fahidi Historical Neighbourhood, the houses that were originally built by the traders from Bastak, Iran – and have now been restored – have come to be the Al Bastakiya Quarter. Here, in Bastakiya, in the Al Fahidi Historical Neighbourhood, you can stroll through the lanes of history and be transported in time in those cobbled pathways, winding away between tightly packed buildings of ochre, the colour of the desert. These buildings are the Al Arish, the typical summer houses of the region, built with the signature wind tower made up of burlap pieces. Al Bastakiya is just across the road from the Al Fahidi Fort (Dubai Museum), with its tell tale Abra docked in the courtyard. Walk down Al Fahidi street towards the creek keeping the fort to your left and you will come to Arabian Tea House. & sprawling complex housing this cafe is the Bastakiya Quarter. Quiet and inconspicuous in the otherwise bustling Al Fahidi, the bazaar where local Indians flock to, this complex that is Bastakiya holds a myriad of interesting restored buildings for culture buffs and the artistically inclined. NOTE: If you are taking a cab then Dubai Museum, Al Fahidi should do the trick. Otherwise simply take the Metro to the Al Fahidi Station and from there it is a 7-10 minutes walk. From galleries that double up as boutique hotels with just the few rooms to rent out, to those that bring together the specially abled to unleash their creative potential, every gallery here is also a café. There is much to discover here and one can easily spend the day just wandering through the maze of buildings and leafy boulevards, never knowing just what one might stumble upon next. It is also in these very walkways that the aptly named, Dubai Art Fair, Sikka (Arabic for alleyway) happens every year around March. Art everywhere at Mawaheb, from the courtyard outside the villa to the terrace upstairs. In the traditional Arabian villas of Bastakiya, there are many art galleries from the old and established ones like The Majilis Gallery to the newer, trendier ones like the XVA Gallery. There is also the Mawaheb, From Beautiful People Art Studio where art in both its artistic and functional interpretations is created by beautiful people indeed. For here people with special needs – ‘the determined ones‘ as they are now known since the directive by His Highness Sheikh Mohammad Bin Rashid Al Maktoum, the Ruler of Dubai – predominantly young adults, come together to discover and voice their creative ideas. If it is a Coffee Museum or a Coin Museum now, it could be a Philately House next, which in great detail traces the evolution of postal stamps and postmarks from the Middle East. Or even a museum dedicated just to the local architecture and its restoration. Arabian Tea House right next to the entrance to Al Bastakiya is like a landmark here. 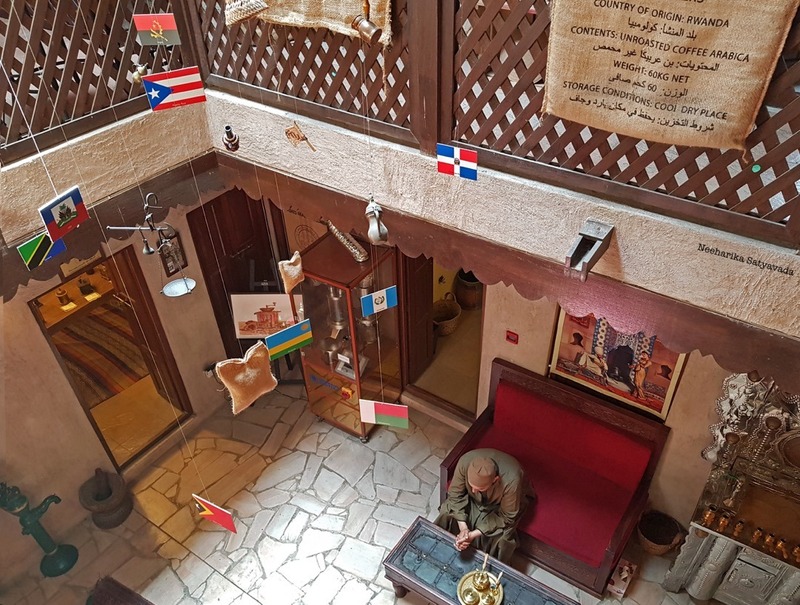 Easy to spot, the traditional Arab vibe draws you in; right from the crowded carpets that welcome you in through the low roof to the whiff of the typical Emirati breakfast tray of hummus and bread being prepared. And, as you begin walking in through the sikkas of the Bastakiya Quarter, the first vibrant place to greet you is the Make Art Cafe. Originally developed as a co-working space in another part of Dubai, it has since been reinvented as an Art Cafe here in Bastakiya. Then there are also the art galleries that brew just as good a coffee as they dish up art, like the XVA Gallery, Art Hotel & Cafe and the Mawaheb, From Beautiful People Art Studio. For a sumptuous spread of Middle Eastern fare, end the day at Bastakiya Nights, in one of the many courtyards of Bastakiya facing the Dubai Creek. This place comes alive at night and transforms the Bastakiya Quarter into a romantic setting straight out of somewhere in the middle of the desert. Also in the Bastakiya quarter is the Sheikh Mohammed Centre of Cultural Understanding. Where one can wind down at the end of a day of walking, with a dose of culture served up with a side of delicious Arabic coffee and dates. Or those looking for a more leisurely deep dive into the Emirati culture can indulge in a local style breakfast or lunch here on prior appointment. To book your cultural meal at SMCCU, Al Bastakiya: Click here. NOTE: One can also club the cultural immersion program at SMCCU with a heritage walk and a visit to the Diwan Mosque or the Rulers Court Mosque. Visits to the Diwan Mosque along with a walking tour of Bastakiya are conducted on Tuesdays & Thursdays at 10:30 AM and on Saturdays & Sundays at 9AM, all around the year except during the holy month of Ramadan. This tour is for about 90 minutes. Hidden in one of the leafy corners of the Bastakiya alleyways, is a traditional two storey Arabian villa, complete with a Majlis (public meeting) lounge that is the tranquil Orient Guest House. The local style rooms in this boutique hotel are also easy on the pocket! The XVA Hotel with its many courtyards and wind towers is the idyllic retreat for creators and artists looking for a restful haven. The café with its award winning vegetarian menu and the art on display in the corridors of this Persian home only add to the mood. You can also choose to stay in Bur Dubai, a bustling residential and commercial neighbourhood minutes from Bastakiya. Entrance Fee: Free. There is no fee to go into the Bastakiya Quarter, to wander through its alleyways or to explore any of its museums even. Timings: The Art Galleries and Museums are open from 10AM to 6 PM. Most of the cafes are open right from 7AM (like the XVA Cafe) to 10PM (like the Arabian Tea House). Quaint and charming! I can already picture myself strolling through those winding lanes or reading a book at a laid-back cafe. Thanks for sharing this little-known side of Dubai. This place is great! I have always loved hummus and would love to have a nice Arabic breakfast with bread and hummus here! The coin museum is another place I would love to see.beautiful pictures and very informative as always!kudos!